Punching thousands of holes in a single part in a punch press will create sheet distortion, no doubt about it. 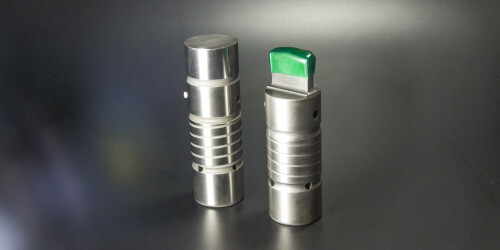 The process involves a punch tip pushing material down through a hole in a die, stretching and fracturing the material through the hole in the die, while creating stress in the area around the punch tip. While there is no way to completely eliminate distortion, there are some ways to reduce it, making life easier on the operator and reducing the quantity of scrapped parts. This Solution Bulletin provides you with tips and techniques that Mate has uncovered over the years to minimize sheet distortion in a punch press that we have found useful. Hole Quantity. If possible, reduce the amount of holes to be punched by spacing the holes further apart. This will not only speed up the punching process, it will also reduce the stress put on the sheet by reducing the number of holes to be punched in it. Hole Size and Spacing. Increase the hole size and the spacing between holes. This will allow the same amount of material to be removed while reducing the number of holes required. Cluster Tools. If increasing the hole size is still not an option, try using a cluster tool (photo, below). A cluster tool allows a number of holes to be punched at the same time. Die Clearance. Correct die clearance is very important to help reduce sheet distortion. Too much clearance results in the material stretching more before the fracture of the slugs occur. Die Height. Be sure that all dies inserted into a turret press are the same height to prevent unwanted marking and help reduce the possibility of sheet deformation. Fully-Guided Tooling. Fully guided tooling helps to insure accuracy and improve tool life, while minimizing sheet distortion. For complete information on these and other techiniques, including machine-specific recommendations, download the Solution Bulletin, LIT00954 Reducing Sheet Distortion.